Imagine it's 2008, and gamebooks do not have anywhere near the presence on the internet that they do now. There's an amusing playthrough blog, a website where people can put up their amateur adventures, some Yahoo Groups, Mark J. Popp's fighting Fantasy, www.gamebooks.org, and a few other gamebook websites that are mainly Fighting Fantasy fan sites, which may be around, or they may have been lost in the mists of time. I was idly looking at these gamebook sites, purely for the nostalgia, and not really expecting them to make much more of a comeback. Then I notice a gamebook competition and decide to try my hand at it. Some other people try to, and I don't do too well. however, it inspires me to try harder for next year, and get deeper into the fledgling gamebook community. In 2009, I do better, but still no prize, so I decide to try harder, and start a blog in order to write my reflections on what makes a good gamebook to improve myself. In 2010, more people have entered and more and more gamebook blogs and sites have either appeared or increased in profile. Now it is 2014, and the Windhammer Gamebook competition has many many entries every year, from people who have used it as their first steps into the gamebook writing community. It has opened my eyes to what can be done with a gamebook and provided a way for gamebook writers and readers to give feedback to each other. Without the Windhammer competition, the gamebook presence on the internet would be a lot poorer than it is now. We have a lot to thank it for. So today, we have its founder, Wayne Densley to talk about the competition and also about his own gamebook series, the Chronicles of Arborell. Enjoy! 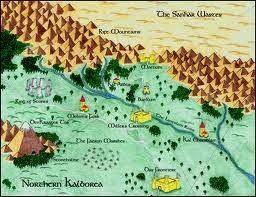 Describe the world that the Chronicles of Arborell takes place in and the background. 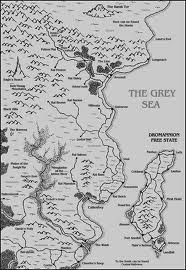 In the Sorrows of Gedhru and Aume, the creation myth of the Oera'dim of Arborell, the world is made from the remains of Emur, the slain son of the Creator-Gods and brother to Elanna and Shabel. The world born of his death exists within a universe of its creator's own design, following a set of rules that allows for both the normal physics of the world as we might recognise them, and also a more hidden, secretive world of magic. Created as a memorial to the life of Emur it is soon corrupted by treachery and murder. Betrayal colours its history and the ruthless ambition of the ancient Trell'sara ensures that life for most sentient Beings in Arborell is neither simple nor safe. The Oera'dim and Humanity are intractable enemies and within the Nations of Men and the Kraals of the Oera'dim there is discord and mistrust. All look to war but amongst the violence and destruction there is also hope and a slim chance for a better future. Arborell is a world populated with the natural creatures of its original creation; the Oera'dim, a race of manufactured Beings that once held dominion over its vast lands; and Human settlers that have come into the world after having fled the power of a merciless and destructive Enemy. The Chronicles are essentially a history of the world of Emur (of which Arborell is a part) from its beginnings to the present day, told from the perspective of all the main characters of that history. Starting with the Gods themselves the history of Arborell is laid out as a series of gamebooks and associated titles, each a standalone title but together forming an intertwined chronicle of Emur and its inhabitants. It has proven a huge task that has so far taken over twenty years, but it has allowed me to develop a history of Emur that begins in creation stories and myth and then develops into historical accounts and a range of personal documents and stories. Along the way I have also found need to develop the language of Haer'al, an Atlas of Arborell, a range of wargaming titles, card-based gamebooks, a growing series of map-based microgamebooks, journals, novellas, supplementary documents, and of course the gamebook series itself that forms the spine of the underlying story. So far there are around forty titles that can be downloaded from the Chronicles website with just as many still to come. What inspired you to write these gamebooks? I began writing the first core gamebook, Windhammer, in 1993. It started as a standalone gamebook and quickly developed into the Chronicles of Arborell. If I was to say what inspired me to begin it was probably the creative challenge of gamebook writing. Putting together all the varying threads of an interactive story so that an author can create a conherent narrative is one of the more difficult challenges in fantasy fiction writing and certainly one that I enjoy greatly. Which gamebook from the Chronicles is your favourite? I must admit that I don't have any particular favourite. What inspiration did you draw from? I think the main inspiration for me has been anything Tolkien, Asimov, Larry Niven and specifically the Dune series by James Herbert. As far as gamebooks go I have found great enjoyment in both the Fighting Fantasy and Lone Wolf series. Will the Chronicles of Arborell be released on other platforms? No. I have no commercial ambitions for the Chronicles and have no plans to release any of the freely available titles on any other platforms. What future releases do you have in the pipeline? At this time I am working on another four micro-gamebooks, a prequel 300 section gamebook titled Vaeyawch (which in Haer'al means "westwards"), the second Windhammer companion, Honour Amongst Thieves, and the Sixth Horde War campaign for the Warriors of the March wargaming system. Half done and waiting for their turn are also the Jotun of the West gamebook, A Murder of Crows and the second core gamebook, Earth and Stone. What inspired you to start the competition? The Windhammer Prize for Short Gamebook Fiction started as an outlet for aspiring authors to find an audience for their talents. Back in 2008 I realised there was a very active gamebook community out there but not much opportunity for people wanting to write gamebooks and have them read by a wide audience. The competition started and has grown with every passing year. Now of course interest in gamebooks has risen again both in paper editions and even more so as apps, and this has led to even greater interest in new authors and innovative interactive fiction. All of that interest has been very good for the Windhammer Prize. Have you noticed any similarities with all the Windhammer Competition winners? Not really. The Windhammer Prize has generated a huge range of original and fundamentally different entries, and this is reflected in the variety of gamebooks that have been selected by readers as prize winners. I really like how much thought authors put into their entries and in the main this shows itself in really cool storylines and sometimes quite surprising settings. What are the things that all entrants need to avoid? Typos and not spending enough time testing the entry before submitting. A number of great stories have been entered in the competition only to do less well because of simple errors in logic flow or straighforward spelling issues. Have you had any surprises with the gamebook entries? The greatest surprise with the entries submitted over the years has been the consistent quality and the new ways authors have found to use the gamebook format. The Prize was started in part to expand the subject matter available to the genre and the success of that has shown that there are a lot of very talented gamebook writers out there. Apart from entering Windhammer, what else can people do to contribute to the world of gamebooks? Let authors know what you think of their gamebooks, and support new authors trying to get their books published when they seek funding on crowdfunding sites like Kickstarter. What is your advice to someone who has never written a gamebook yet, but is thinking about it? Spend a good amount of time planning out what it is you want to do, especially when considering the different story branches and the game system you are going to use.. All that preparation saves a lot of time and frustration when you start writing. So check out Arborell and the Windhammer competition. Still super impressed at your theme. How far in advance did you get them all written up?